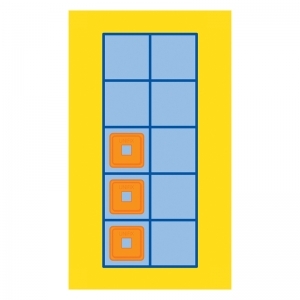 This standard size deck of playing cards is printed with Ten Frames to help students to see the different combinations that make 10 and to internalize the value of these numbers and their relationships. Ten Frames are one of the most important materials to help student visualize the anchor number of 10. Playing cards can be used with large groups, small groups, partners, individuals or in centers. Contents: 46 cards: 4 sets of Ten Frame cards (dots with frames) for 0-10. Suggested activities included. 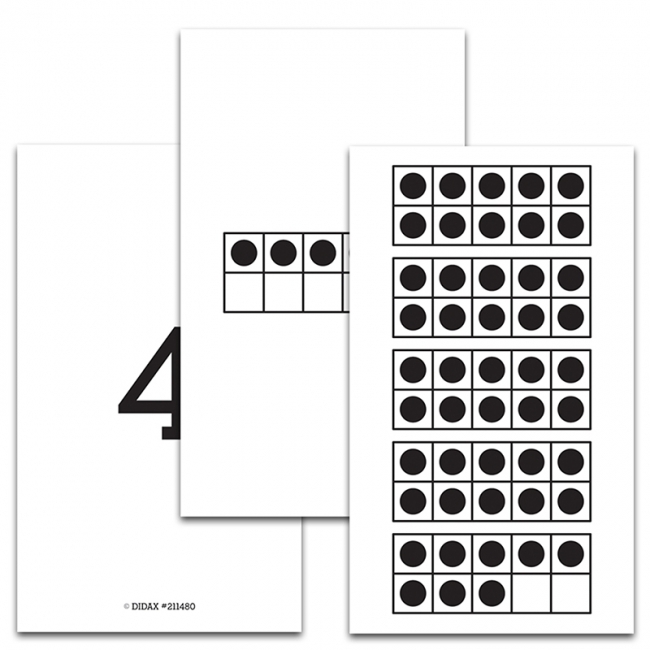 Ten Frame & Dot Cards provide opportunities for students to explore numeracy and computation using benchmark numbers. Set of 107 cards (4"x6") comprising 4 sets of ten frame cards (0-10); 4 five frame cards, 1 set of dot cards and activity suggestions. Ten Frames are one of the most important materials to help student visualize the anchor number of 10. The cards help students to see the different combinations that make 10 and to internalize the value of these numbers and their relationships. 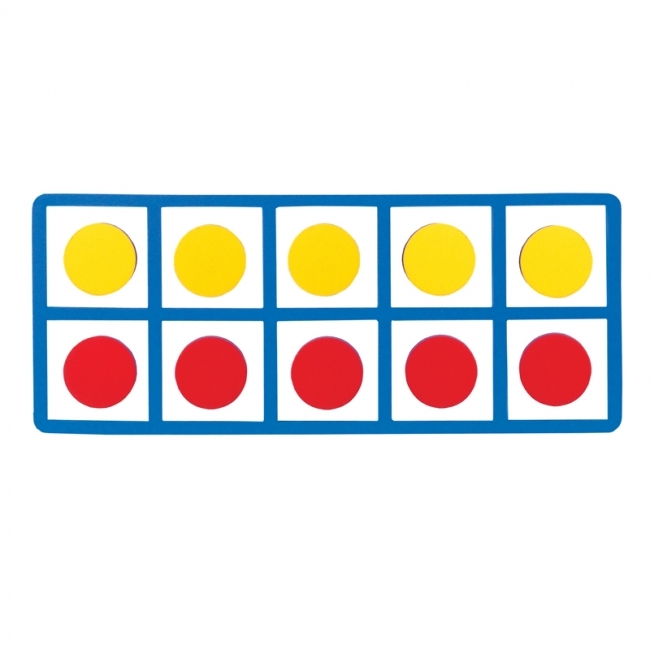 Ten Frame cards help students in counting, counting on, addition and subtraction. Ten Frame & Dot Cards can be used with large groups, small groups, partners, individuals or in centers. A powerful tool to help students represent values that are easily counted using the ten frame model. Learn to count values by making groups of ten and then adding what is left over or decompose values to calculate two or more values quickly. Includes a set of red dice: one numbered 1-6, the other numbered 0 and 5-9. Also includes a set of blue dice: one has numbers 10-60 printed, while the other has numbers 50-100. 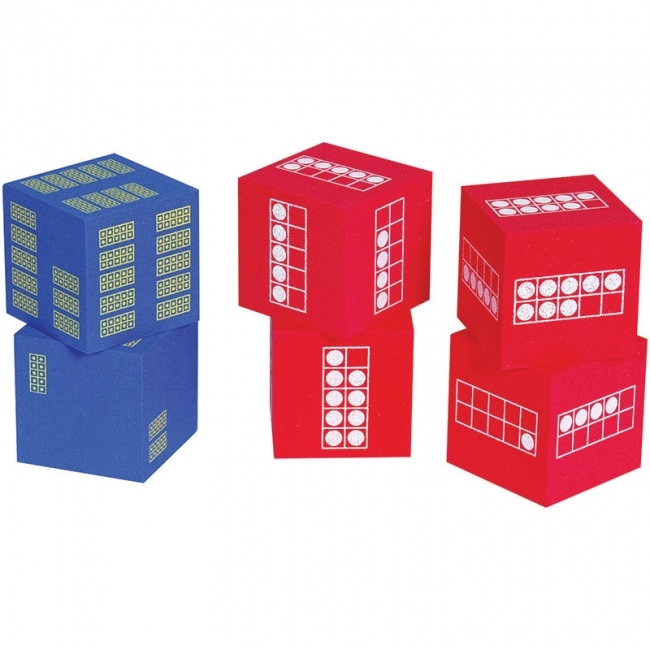 Set of 6 includes and combination of 4 red and 2 blue dice. These cubes will provide students the hands-on practice they need for the development of number sense, giving them visual representation for what they are learning. 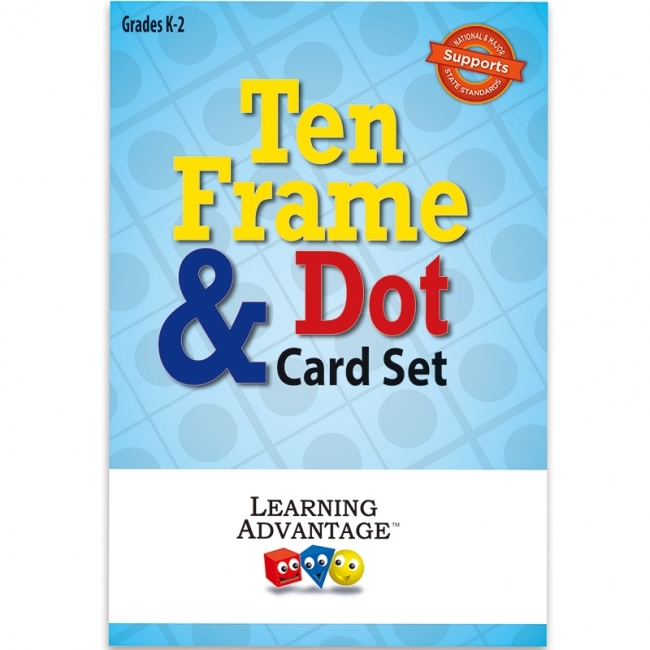 The key advantage of the Ten Frame Foam Dot Dice is that students can visually see and quickly count the quantity of dots in a ten frame for any roll. When the students understand that the dots on the ten frame represents a number, add the second red die and roll both dice together. 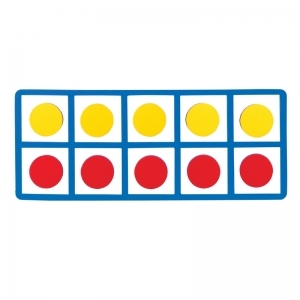 Once the students have an adequate understanding of the red single digit dice, show the blue dice containing groups of full ten frames. 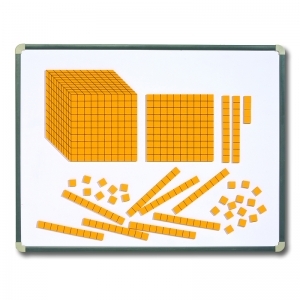 Transparent base ten allows the teacher to use the three dimensional units, rods, and flats on the overhead projectors. Student can better understand the decicube concept of being made of one thousand units. 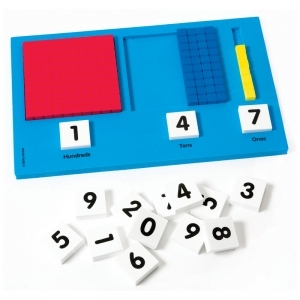 To aid in learning place value, number concepts, operations, measurement, fractions, decimals, percents, and volume. ? Starter set, includes 100 units, 30 rods and 15 flats, boxed. To aid in learning place value, number concepts, operations, measurement, fractions, decimals, percents, and volume. 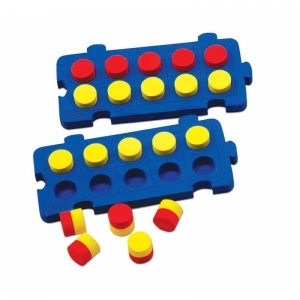 ?This magnetic Base Ten set is ideal for use with magnetic boards! Pieces are made from 19mm thick foam which makes them extremely durable for class use. 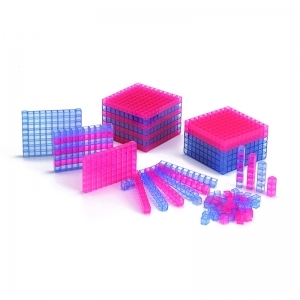 Set includes 100 unit cubes, 10 rods, 10 flats and 1 thousands cube. Thousands cube measures 26cm x 26cm. 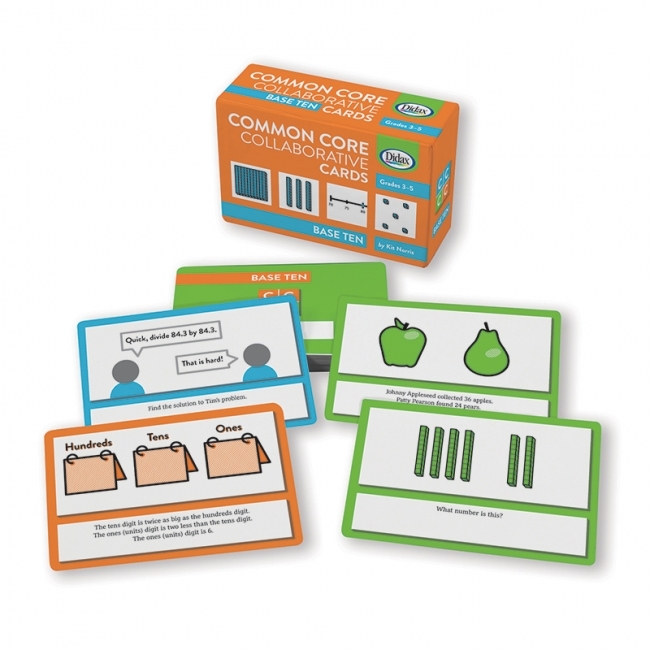 Practice and reinforce the content from the Common Core State Standards with these innovative activity cards! 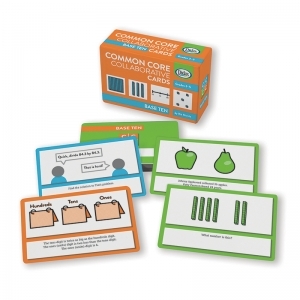 These uniquely designed cards can be used as a whole-class activity. First, students solve the problem on their own card; then students with the same answer form collaborative groups for further problem solving activities. Or use cards in smaller groups or individually to give students additional practice with the content they need to know. Each set contains 120 cards, 40 cards per grade level, that can be assigned on or off-grade level as necessary. The set also includes four additional cards are for a teacher to create his/her own custom problems. Durable, two-color cards measure 4" x 6". Teacher's guide provides complete instructions including suggestions for problem-solving lessons for the collaborative groups. 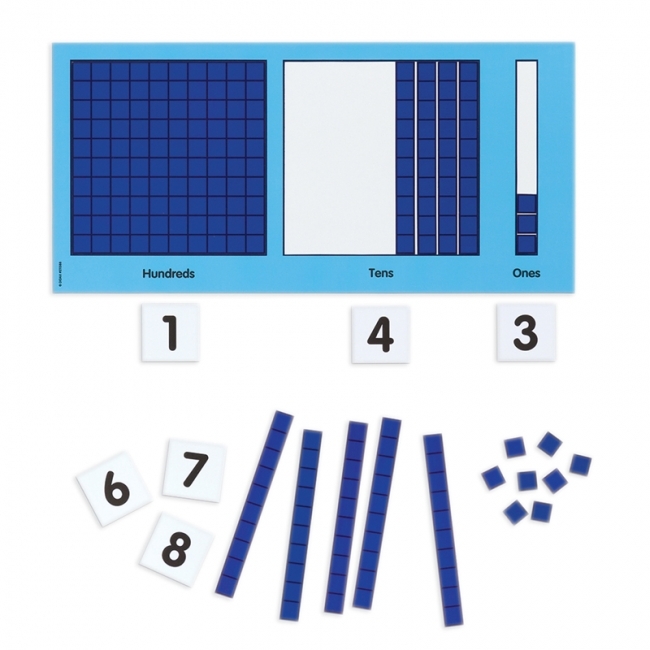 Small sets of our most popular manipulatives make it easy and affordable to get manipulativeschildren learning the hands-on way! Great for parents and as starter sets for teachers. Easy-to-use activities are included. Set of 50 (3.5" x 6") cards showing ten-frames to 50; with ten-frames on front and number on reverse. 50 creative lessons for teaching with ten-frames! This reproducible activity book, written by two prominent math educators, includes 50 complete lessons using a variety of ten-frames materials and techniques. Each lesson features a detailed alignment to the Common Core content and practice standards, step-by-step instructions, and an assessment of student responses. 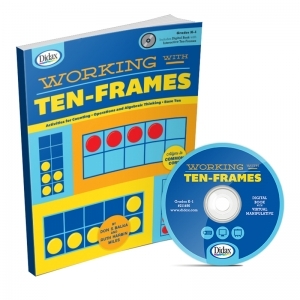 CD includes digital book and virtual ten-frames tool to use with any computer and whiteboard. 160 pages. Grades K—2. 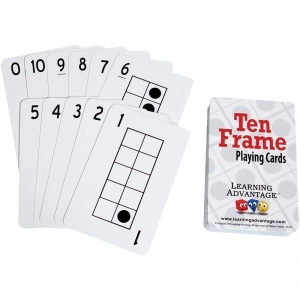 Attractive cards for ten-frame activities! This set includes 60 full color ten-frame cards featuring Unifix cubes. 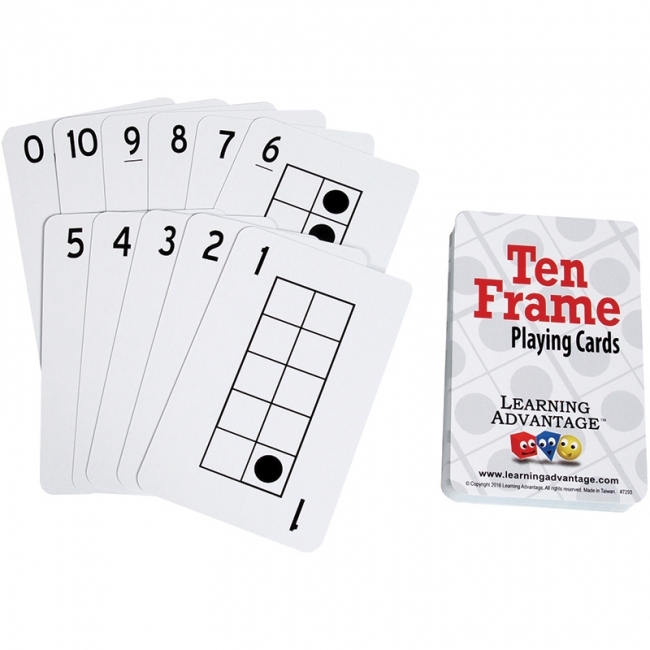 Included are four sets of ten cards displaying 0—9, ten cards displaying 10, and ten empty frames. Includes example games and activity ideas. Cards are 3 1/2" x 6". Packaged in clear hanging bag with header card. Grades K—2. 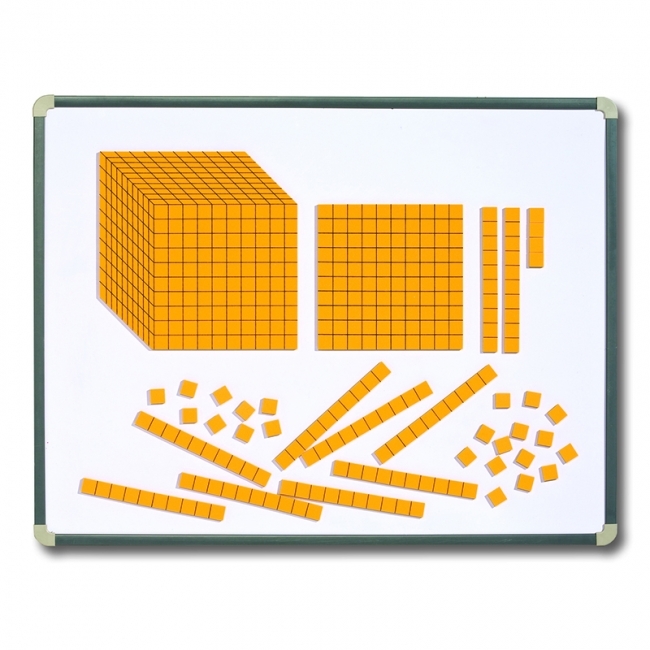 Students will learn to model ones, tenths, and hundredths with this innovative foam frame. 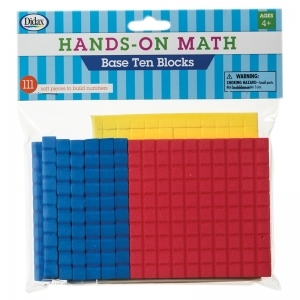 Use with standard 1-centimeter base ten blocks (sold separately) to represent and work with decimal numbers and equations. 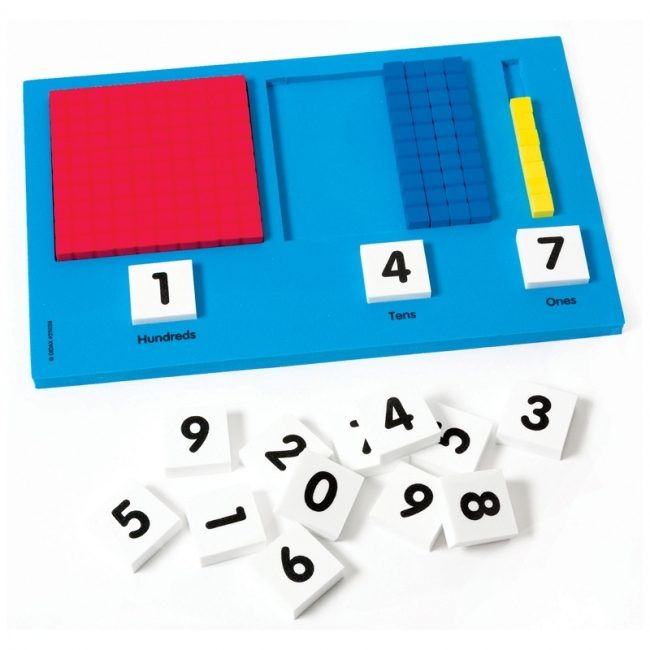 Includes frame, 21 number tiles, and teaching notes with activities for math standards.11" x 7". Grades 3-5. 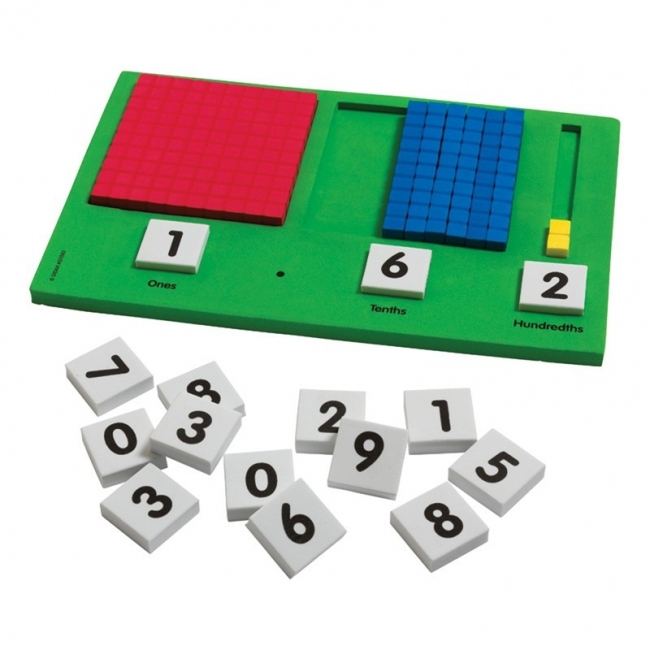 Model essential base ten and place value concepts for the whole class or for small groups with this clever tool. Works on any magnetic surface and consists of frame, base ten pieces, 21 number labels, and extensive teaching notes related to math standards. Frame measures 18" wide by 9" high. 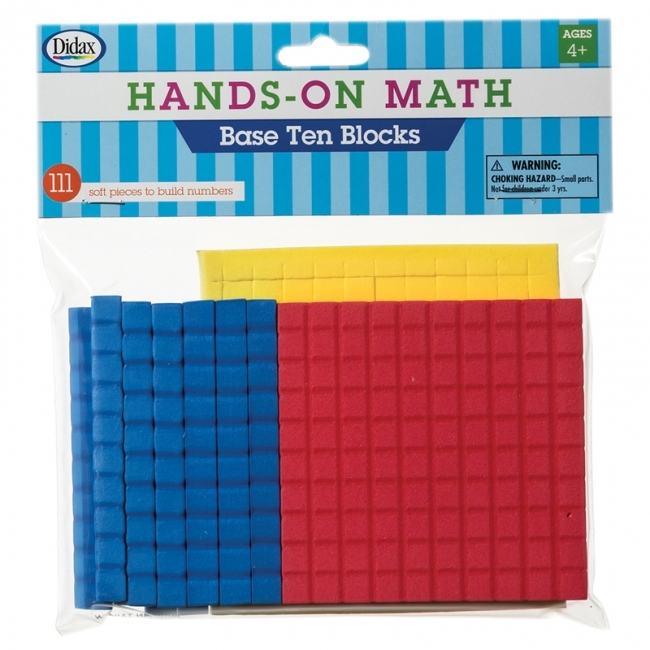 Base ten cubes are 0.625". Includes 20 unit cubes, 20 ten rods, and 1 hundred flat. This is a large magnetic version of our Base Ten Place Value Frame. Grade K-2.